In the Information Age, traditional household items are gradually giving way to new, more modern ones. The same thing is happening with thermostats. Why would you live in the past and use an old-fashioned thermostat when you can try out the modern smart thermostat technology? The difference between the two types of thermostats is similar to choosing between a horse carriage and a brand new SUV. You will be amazed to see how much money you can save switching to a programmable thermostat. 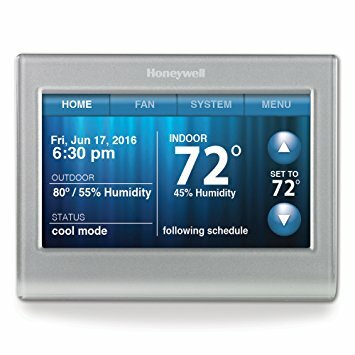 The Honeywell RTH9580WF Wi-Fi thermostat does not only provide you useful information about your home environment or HVAC system status, but its touchscreen display is also very pleasing to look at, as well as convenient to use. Honeywell’s smart thermostat displays the current temperature and humidity in your home (as well as on the outside); day, date, and time; your HVAC’s current operating mode; target temperature and buttons for adjusting the target temperature. The Honeywell RTH9580WF is easy to setup and use even for those who do not know much about technology. The thermostat can be used at home as well as in business space. 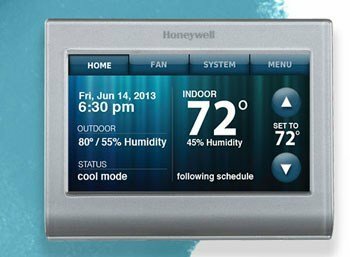 The smart thermostat can be controlled directly from the control screen or through PC/smartphone by using Honeywell’s app. Users with multiple properties can manage the temperature in all their properties from the app. The smart technology of this thermostat gives the user almost unprecedented control. In addition, it is incredibly simple to use. Honeywell claims that their device can be controlled from anywhere in the world, thanks to its Wi-Fi capabilities and the free smartphone app from Honeywell. With the Total Connect Comfort app you can always be in control of the temperature of your home, regardless of your location. This thermostat comes with a silver frame, but its smart technology allows its users to easily adjust the color of the panel screen so it could blend into its surroundings. Honeywell RTH9580WF and the app that comes with it give you the ability to create a schedule and therefore also save some money. You can create your own schedule or answer a series of questions and have the app create it for you. Of course, the schedule can be edited any time. Besides, this smart thermostat can also adjust your heating and cooling schedule to reduce energy use during peak hours. The device can automatically access records from utility companies to determine the peak hours in your area. Smart Response is an internal system which monitors and analyzes how you program your thermostat over time. After some time the device will start to tweak its heating and cooling to match the temperatures that you usually choose. Over time, the device will go as far as to learn which temperatures you prefer in your home for every week of the calendar year. How amazing is that? As already mentioned, Honeywell RTH9580WF comes with an app that is very easy to use. The app can be downloaded to any PC, Apple, or Android device. 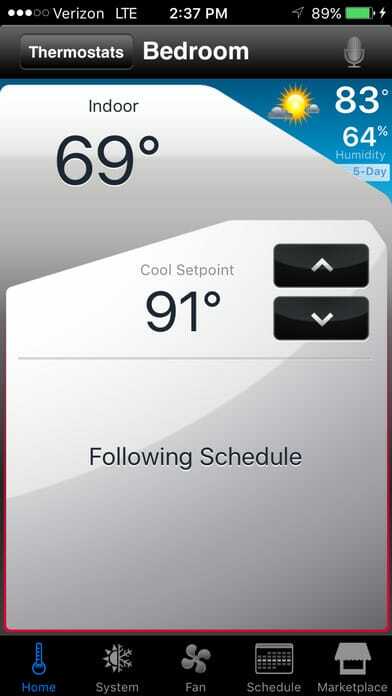 What the “Total Connect Comfort App” does is give the user remote access to the thermostat, so that they can enter information into the control panel. The app is completely free and there are no hidden fees associated with neither it nor the thermostat itself. The device can learn your heating and cooling preferences over time. The settings can be controlled via Honeywell’s Total Connect Comfort Service app and Amazon Alexa. Multiple users can control the device. PIN lock can be set up to prevent unauthorized settings adjustments. Customizable screen colors to blend in with the surrounding décor. This is an older model from Honeywell. The device does not have motion/proximity sensors which could trigger the HVAC system if someone is home outside of the typical schedule. There are no data reports (monthly energy report). The thermostat is made out of inexpensive materials. Some users complained that the thermostat system is complicated to install. Can Honeywell RTH9580WF Switch Automatically from Heating to Cooling? Many thermostats do not have this option. However, Honeywell RTH9580WF can automatically switch from heating to cooling. Even though there is no need for this except a couple of times a year, the feature sure does come in handy. Since this thermostat runs off wall power and requires a c-wire the answer is pretty clear. If the power goes out, the device won’t work as well. Luckily, all the settings will remain saved in the memory of the device. When the power comes back on, this thermostat will continue to work normally and won’t require any specific action from the user. The thermostat does use the internet, but it won’t malfunction if there is no internet available or if there are connectivity issues. The only problem that may arise is that the user will lose the ability to control the device via the app. On the other hand, the user still can control the thermostat directly via the touch screen interface. Even though Honeywell RTH9580WF is an older model, it stands the test of time. This unit is a perfect choice for every person who is looking for a relatively inexpensive model that is easy to use and has many useful features. This smart thermostat provides a user-friendly experience and is ideal for home owners as well as business owners. Its touch screen looks modern, even though not as modern as the most recently developed smart thermostats. On the other hand, if you require data reports or a thermostat with motion sensors, then, unfortunately, this device is not the right choice for you. We recommend you check out our recommendations for the best smart thermostats in this guide.